Real business people sharing their personal social stories. Available on Amazon for Kindle devices and apps. Seen real success in social? Let us know. As the world has embraced social media in its many forms, we have seen a massive explosion in both the amount of social content you can find online and the volume of advice coming from various pundits insisting that social engagement is the new panacea for successful online marketing. The Internet is practically cluttered with guides and infographics that tell you how to write a better blog post or schedule your tweets. Each of them promises to help you find the best return on investment for your time and resources. The problem here is that all of these social media advocates have one thing in common: a vested interest in seeing us buy into the idea that social activity will drive sales for our businesses. Now, that’s not to say that social engagement can’t bring sales. It can. And there’s nothing wrong with selling on social media per se. But chances are that the way in which it does bring them may not be quite the way you expect. And as we all know, expectation is the mother of all disappointment. In other words, much of what you read about social media amounts to hype or sales copy. In a (possibly misguided) attempt to cut through that layer of fluff, the authors of this short guide have come together to share some of their insights into the reality of using social media for business. The result is Disruption. 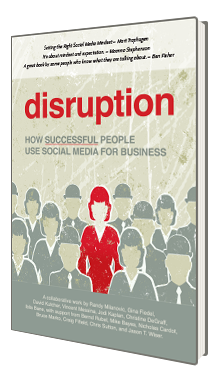 Disruption is the collaborative work of several authors, including Randy Milanovic, Gina Fiedel, Vincent Messina, David Kutcher, Jodi Kaplan, and Christine DeGraff. It was edited by Iblis Bane and Jason Wiser.